Here is an update from Beth Newton, a missionary near the hospital in Les Cayes. Would you pray with us for a visiting doc for our Haiti clinic? I thank the Lord for your fellowship in the gospel and the joy of your friendship. Is it beginning to look like fall around you? We’re enjoying the beauties of God’s creation here in central Ohio at this season. God brought me safely to Ohio August 29, to help my dear senior parents pack and move to a new home. So much STUFF, and difficult decisions. We all are well. Emotions are up and down, and we pray for God’s peace and wisdom as we thank Him for His bountiful care. We received the keys last Friday (4823 Hazelton Etna Rd SW Pataskala OH 43062) and will set a moving day after a contractor makes some adjustments in the house, necessary for seniors. We appreciate your prayers that God will keep us moving forward with faith, wisdom, protection and thankful hearts. Years ago I had the joy to meet and become friends with a lady physician in Lexington, SC. Dr Jo has continued working as a psychiatrist in the Lexington area, but God has also called her to share her professional care with needy people in Haiti. For a good number of years she’s been able to come to our hospital/clinic every 6 months, bringing gifts of medication and prayers of scripture to share with her patients. We’ve seen many patients with faces of fear and disoriented thoughts return with big smiles and clear stories of changed lives. Dr Jo has planned to come work in the clinic again for 2 weeks. She bought tickets to come October 23, but last week developed severe lower back pain. This past Monday, she told me she planned to go to work there in Lexington, but would stand as she consulted her patients that day. Oh my. Our clinic in Haiti needs to know by October 9, if they should make a radio announcement of Dr. Jo’s coming. The patient families can then call the clinic and make an appointment to see her. · GOD’S DIRECTION – Is it God’s will for her to come at this time? We praise and thank the Lord for sweet fruit from camp this summer. You invested and God has blessed. One of the Child Evangelism workers sent the following good news and photos of the two camp groups, first the teens and then the younger campers. We want to thank you again for all your support in favor of the kids and Teens of the Bible club in Torbeck. We have GOOD NEWS that Pierrson Tinelus invited Jesus into his life in the Teenager camp. He told Vionel that he is already three years with you (in the club), but during camp he felt God is speaking to him very clearly through the bible messages from Jacky Gilles on the life of Peter. In addition, was Jean Ricardo who prayed with Jean during the younger kids camp. These two from the Torbeck club were able to go to camp because of their effort in the contest, and the “scholarship” money available. Thanks for all your Prayers. God did mighty things for us this year – also it was very attacked, but yes, this is always a good sign. We rejoice and pray God will continue to water the seed of His truth in their lives! Pray with us for the special needs for club kids for this fall. I need to be in Ohio to help my parents with their move, and will be traveling that way August 29. Don’t know yet how long my presence is needed. A youth worker told me yesterday he is willing to do a Bible study with the teens during club time. 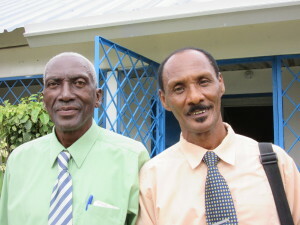 The photo below shows our two new clinic chaplains, left to right, Pastor Lucio and Pastor Zidor. They were commissioned last Monday as the new chaplains for our clinic/hospital, the Health Center of Light. Yesterday they were smiling as they told me about the blessings of praying with 12 people to receive Jesus as their savior during the past week. God knows each heart and we pray the seeds of the gospel will be watered well in local churches. Pray with us that Pastors Lucio and Zidor will be filled with God’s spirit and love as they serve with us and share Jesus with many needy ones. I arrived back in Les Cayes, safe and sound with my luggage on Friday evening. Thank you, my friends, for serving with me as you pray. I will return to Ohio August 29, to help my parents with packing and moving. Praise God for the provision of a lovely new home with two “in-law” suites, one for Jim and Nan and family, and one for me. It will be available to us October 1. We pray He will lift our hearts and give His strength as we seek to do His will in the challenges of this move.